The property has a private jetty and commands elevated northerly views over Wallis Lake and Seven Mile Beach. Positioned on Wallis Lake just 10 mins to Blueys & Boomerang beaches. A great location for group bookings or also as a private escape for a couple wanting to enjoy the quiet bush setting. The lawns provide ample space for children & adults to play lawn games, volleyball or badminton (equipment provided). There are also bush tracks & a full size tennis court. Short walk to the lake, picnic tables & private mooring & jetty, BYO boat small boats can be launched from beside the jetty, or hire a motor boat. Choice of comfortable accommodation maximum capacity 10- 12 adults. Ideal for family groups. The 2 bedroom Cabin sleeps 4 and the 4 bedroom Lakehouse sleeps 8. Fully self contained & equipped with TV, DVD, stereo, video, microwave, dishwasher, hammocks, outdoor furniture on decks with gas BBQs, large entertaining deck. NB - Please confirm prices with owner for quotes on Lakehouse, Cabin or both. Discounted rates are available on off peak dates.The site quotes on the cabin only. Please note that during peak times (eg Christmas) the Lakehouse and Cabin must be booked together. An $800 Bond for the Lake house & $250 for the cabin applies. Beautiful lake front property on acres on Wallis Lake 10 minutes from 5 Beaches. Water Ski, fish, swim, sail, kayak from the private jetty off the point at the end of the track - you can drive or walk down. Enjoy a drink and a BBQ on the huge deck or just hang in the hammocks and watch the sun set. This is a home made for holidays - plenty of room to relax. take a paddle board & explore the lake, launch your boat down by the jetty spot for the boat & boat over to the Recreation club across the lake or to the boat house for lunch or boat to Forster. *tennis court with basketball hoop. 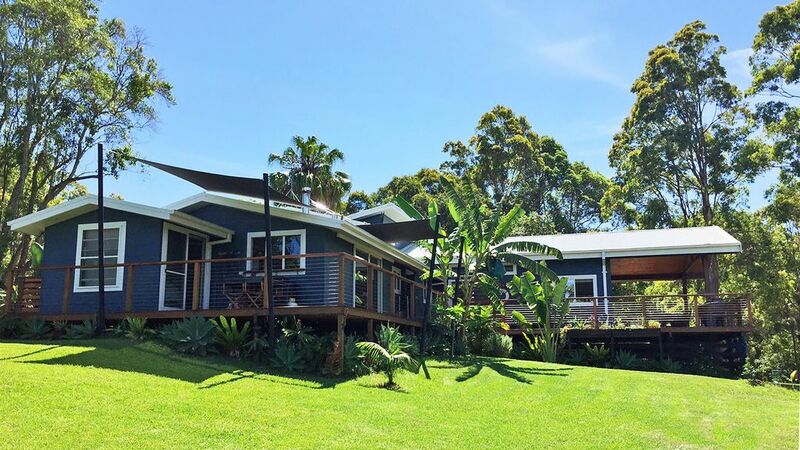 With seven outstanding Mid-North coast beaches, three coastal lakes systems and National Parks on the doorstep, Brushy Point is ideally situated for a memorable summer holiday in one of the most beautiful and unspoilt parts of New South Wales. 5 min drive to the Wallingat National Park - drive up to the Whoota Whoota Lookout, with far-reaching views over the coast, the long stretch of Seven Mile Beach to Forster and the islands of Wallis Lake. In Booti Booti National Park at Elizabeth Beach 5 mins drive away, beginning at the north end of Elizabeth Beach, is a lovely 7- kilometre bushwalk, running over the cliffs to Seven Mile Beach before cutting back along the Wallis Lake front.On the west shores of Wallis Lake, Pacific Palms in The Great Lakes District. Turn off The Lakes Way onto Coomba Rd travel 5.1kms take a right at the flags 1km drive through the casurina forest to the Point. Swimming, fishing off the jetty, kayaking. Play tennis or volleyball. Learn to sail & windsurf , hire or bring a motor boat. Surfing & swimming at Blueys, Boomerang, Elizabeth Beaches & Sandbar. Take a mountain bike into the Wallingat, swim with the dolphins or go diving or sport fishing in Forster or Seal Rocks. Eat out at local restaurants or cafes (all just 10 mins). There are numerous other nearby activities from golf to horseriding.